MONTREAL, April 4, 2018 /CNW Telbec/ - Air Canada today unveiled an expanded range of North America Economy fares to give its customers greater flexibility to select the airport and onboard amenities they want when travelling. In redesigning its existing Economy fares the airline is introducing a new comfort fare that provides customers a wide range of features, including complimentary access to Preferred Seats, and the option to purchase other amenities such as Maple Leaf LoungeTM access. "Air Canada recognizes that people have different requirements when they travel, so we are expanding the range of choice for our Economy customers with our new suite of fares. Each fare type offers customers specific attributes as well as options to purchase additional benefits and amenities that vary based on the type selected, such as extra legroom, upgrade eligibility, or lounge access," said Lucie Guillemette, Executive Vice President and Chief Commercial Officer at Air Canada. All Economy fare types provide customers with Air Canada's award-winning service, complimentary carry-on baggage, free inflight entertainment, and the option to purchase onboard Wi-Fi access where available. The new range of economy fare types will be available for purchase on flights across the Air Canada fleet, including Air Canada Rouge, for flights within North America beginning April 4. 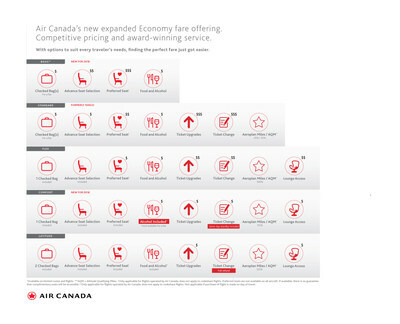 For more details on Air Canada's new Economy fare options please see aircanada.com/economyfares. Air Canada is Canada's largest domestic and international airline serving more than 200 airports on six continents. Canada's flag carrier is among the 20 largest airlines in the world and in 2017 served close to 48 million customers. Air Canada provides scheduled passenger service directly to 64 airports in Canada, 60 in the United States and 98 in Europe, the Middle East, Africa, Asia, Australia, the Caribbean, Mexico, Central America and South America. Air Canada is a founding member of Star Alliance, the world's most comprehensive air transportation network serving 1,300 airports in 191 countries. Air Canada is the only international network carrier in North America to receive a Four-Star ranking according to independent U.K. research firm Skytrax, which also named Air Canada the 2017 Best Airline in North America. For more information, please visit: www.aircanada.com/media, follow @AirCanada on Twitter and join Air Canada on Facebook.